The India arm of Hyundai Motor has regained the position as the nation’s largest exporter of cars and SUVs in the April-August period, beating the local unit of Ford Motor. 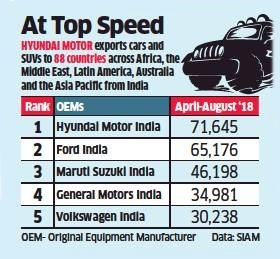 Hyundai Motor India exported 71,645 vehicles from India during the five months, up 23% from the same period a year earlier when it was ranked second. Ford India’s shipments to foreign markets fell 12.5% in the period to 65,176 units. South Korea’s Hyundai Motor exports cars and SUVs to 88 countries across Africa, the Middle East, Latin America, Australia and the Asia Pacific from India. Among India-made models, there is strong demand for the Grand i10 and i20 in Africa and Latin America, the company said. Compact SUV Creta sells across the globe, while the mid-size Verna sedan is extremely popular in the Middle East, it claimed. An analyst cited Hyundai’s efforts to keep its product portfolio refreshed and Ford’s failure to do so for the contrasting performance. The local units of General Motors, Nissan Motor, Volkswagen and Suzuki Motor all posted a decline in exports in the first five months of this fiscal year. Renault, Mahindra and Mahindra and Honda Motor were the automakers apart from Hyundai that posted higher exports from India in the same period. Some car makers that are facing weak local sales are boosting exports, leveraging the country’s low-cost labour, infrastructure and electricity. However, a few believe in and focus on strategic products which do well both on the domestic as well as international markets, industry experts said.